Rebranding is no small task. It's critical that partners understand the holistic approach Veeam's CMO is taking — every step of the way. 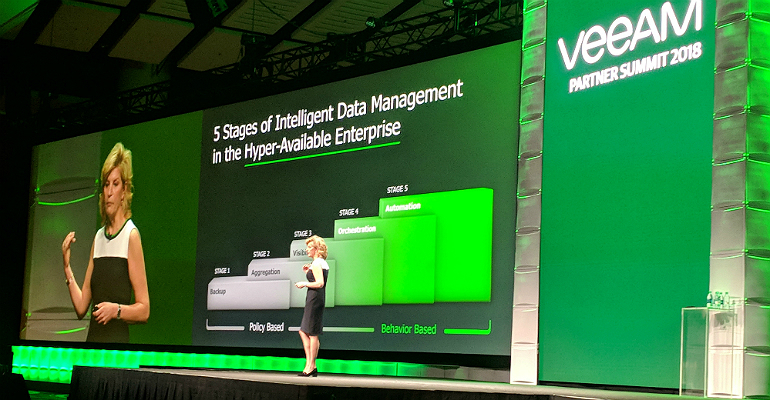 VEEAMON PARTNER SUMMIT — Hired in October, Kate Hutchison, chief marketing officer at Veeam, is working to create a powerhouse brand to match the company’s aggressive growth strategy, which is to capture a big slice of a projected $30 billion “hyper-availability” market and enterprise business customer. A hyper-available environment is one that’s always on and provides access to data at your fingertips. The newly hired CMO sports an impressive résumé, having held top marketing jobs at Riverbed, Polycom, VMware, Citrix and BEA; she also has an 18-month transformation effort ahead of her. That effort includes making sure that partners become experts on positioning and selling the Veeam platform and align with the company’s vision and strategy. With that, Hutchison said the company is improving its positioning and is transforming its brand. Expect to see Veeam position itself as a thought leader among CXOs and Fortune 5000 companies as solving an urgent and strategically relevant challenge in a new way. What that means to partners is being able to move from selling a point or tactical solution to being able to sell a complete solution for intelligent data management. Platforms also enable partners to deliver more value-added services, she noted. Partners need to know that brand transformations aren’t easy. They require a lot of change within a company, but when done holistically, they send a powerful message that something about the company has changed and it’s time to take a fresh look. Hutchison’s approach to repositioning Veeam includes: brand promise, vision, strategy, positioning, messaging and identity — think of those elements as a pyramid with brand promise at the top. “We’re giving you a more powerful story to take to the enterprise by ‘up-leveling’ the value of Veeam. You’ve already shown how successful you can be in the SMB and commercial markets. Now we want to make you very successful selling into the enterprise,” said Hutchison.